(U) According to FM 3-24, the population is the center of gravity for COIN operations. Afghanistan‘s population is roughly half female, half male, but in Afghanistan, the culture segregates by gender. As such, the appropriate operational response that is culturally sensitive to that segregation is to interact male to male & female to female. We want to understand 100% of the community by engaging them directly (Figure 1). By doing so, we get the insight that we need, while being respectful of the culture, yet building the fundamentally essential social contracts founded on trust and established in a cooperative environment. That social contract needs to be with the male and female population…both of whom are making decision about the future of this country, whether publicly or privately. ISAF forces are currently making decisions along all lines of operations that affect the entire population but with limited insight or perspective from the female half of the population. (U) In a non-permissive to semi-permissive environment, military service members are often the only personnel interacting with the local populace because of security constraints that prohibit other development, state building and nation building partners from working in the area until security improves. As such, military members establish the first lines of communication with the residents and gather information that informs the commander‘s critical information requirements. Afghan cultural context of segregating females results in the predominantly male coalition security forces being prohibited from interacting with 50% of the population. If coalition forces are to get information from the female half of the population, then military females will be the one‘s getting the information because they are the only females operating in high threat areas. This information is the baseline to inform all follow-on operations. (U) Lethal and non-lethal information collection should not be blurred. The military clearly defines and distinguishes the missions of civil affairs (CA) teams and human information and intelligence (HUMINT) teams. CA teams collect information to support civil military operations. HUMINT teams collect information to support intelligence requirements. While they can be mutually supportive, the teams use separate soldiers for the different missions. Despite limited female resources, the missions conducted by FST, FET, and FHET teams should remain distinctly separate with separate team members (Figure 3). 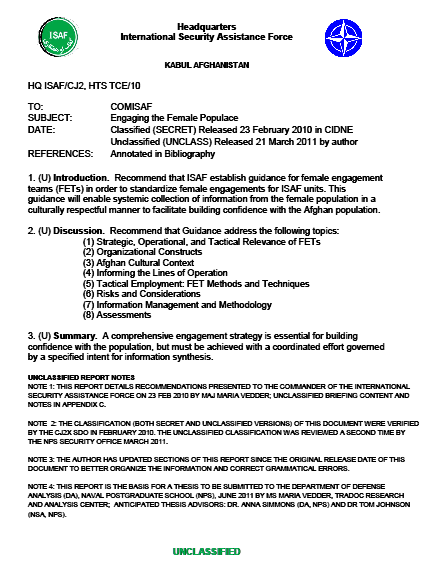 Otherwise, military units risks alienating the Afghan females and losing the support of their male relatives, by making the Afghan females feel threatened or deceived by the military females One Marine leader states that there needs to be a ―distinction between security, engagement, and exploitation missions. I think this is very important in the initial planning stages because the tendency is for people to marginalize the difference. People do so because we lack adequate number of females and people assume all missions can be covered by one entity if adequate training is applied. All three types of operations are needed for comprehensive response, but they are markedly different. The classified version of this reports details these distinctions in more depth. (U) Afghan women represent half the population and exert influence in the community as property owners, primary caregivers, arrangers of marriages that bind families, and inter-family peace makers. In COIN operations where the populations is the center of gravity, efforts to communicate with and understand the needs of the Afghan female population is required to leverage their influence with males and with the vulnerable adolescent population that is prone to recruitment by enemy forces. (U) The author derived the majority of the information presented below from a briefing and notes taken during classes given by Shaista Wahab at the University of Nebraska at Omaha in April 2009. Supporting quotations from other author‘s documents are referenced accordingly. Women are the symbol of honor of their family, their tribe and the country.